In Hatha Yoga we teach three methods and three kind of objects of concentration. 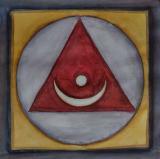 Dharana is practised with concrete objects as well as formless abstractions. 1.) The first method of dharana combines the withdrawal of the senses from the sense objects (pratyahara) that is followed by an inward turned concentration on the primordial unchanging nature of the mind (atma), still untouched by differentiation into knower and known. It is an inborn state of every being, always resting in itself, primordial free from outer and inner changes. 2.) The second method of dharana consists of the abstract concentration on the principle of formless space, without any attributes and elaborations, the emptiness (akasha, shunya) as well as the contemplation on an all-encompassing and all- penetrating principle (brahman) that permeates the outside as well as the inside of the body. 3.) The third method of dharana consists of using an arrangement of real and imagined, concrete objects of meditation. The objects used are the geometric symbols, colours and sounds of the five elements (panchamahabhutas), which are aggregation states, their five related mantric seed sounds (bijas), the five corresponding life energies or winds (prana, vayu), five senses (indriyas) and five organs of activity, (karmendriyas) as well as deities (devas) and diverse other principles (tattvas). The aim of these exercises is to become aware of the interweaving and mutual influence of all principles, reflection is done on the unity and indivisibility of the inner and outer world. That way these principles can be masterd and controlled by prolonged practise. The practical exercises that consist of concentrations on these principles start off easier in the stage of dharana and are deepened, broadened and prolonged in the next limb of Shadanga yoga called Immersion (dhyana).